Noah Gundersen concert with Jordan! Huevos rotos con morcilla – potatoes, eggs and pig’s blood! Parque del Retiro with my flat-mates. If I have learned anything this month, it is that the best experiences come from outside the comfort zone. To be honest, there has not been a perfectly “comfortable” moment here in Spain. Leading up to this experience, I was constantly overwhelmed with not having a single clue on what the heck I was doing. Now in Spain, it is a day-by-day process. 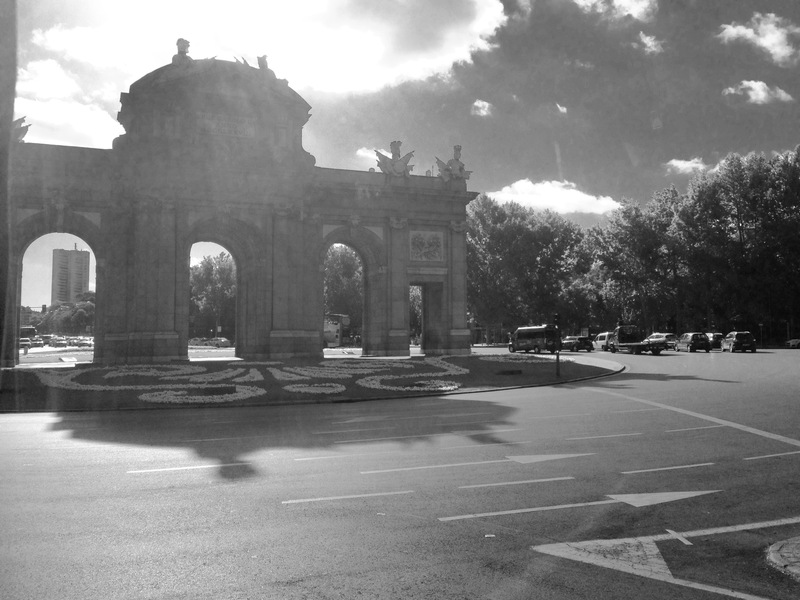 I am slowly wandering around the city and figuring out my Madrid-life one step at a time. There has not been one day where I haven’t been lost, confused, or completely unaware of what I am supposed to do. But it has been one heck of an adventure so far! In a nutshell, we did exactly that. Claudio invited Louisa and I to go out with his friends he made that semester. We went out for drinks with other students from the Netherlands, Sweden, Germany, Italy, France and Spain. We met on the terrace of a local bar. We sat outside among the warmth of fire-pits and I listened to the memories shared by a great group of friends. We continued the night at the iconic seven-story “Kapital,” which is one of the largest and well-known clubs in Europe. We pursued the night the Spanish-way by jammin’ to reggaeton, dancing ridiculously under raining confetti and by finding our way home at 7:30 a.m. It was one of the most fun things I have ever done! That night was also the moment I learned that it is OK to accept/extend invitations from strangers- like Claudio (who knew me for a day) did for me. It opened my eyes that there are incredible people everywhere around me, and it is discouraged to say “No” and not give a random opportunity a chance. I randomly said “yes” to a day-trip with other students from my university to Toledo, Spain. We ended up accidentally getting ourselves into the middle of the Carnaval (a massive Spanish parade where everyone was in costume) which was one of the most exciting festivals I have ever seen! I randomly said “yes” to an Italian girl who kept offering me Italian digestive cookies each day in class (Maybe I looked like I needed to digest…I’m not sure). I finally took her cookie one day, and we became friends. I randomly said “yes” to booking a spontaneous flight to Sweden. I was able to see one of my greatest friends-Anton-for the first time in two years! I randomly said “yes” to taking a salsa/merengue dance class. Although I lost part of my dignity because of my embarrassing inability to dance, I might have learned a move or two. Most importantly, it was a great night of speaking Spanish and meeting new people. I randomly said “yes” to a random Spanish dude I became acquaintances with to a walking-tour of Madrid. He showed me the coolest bars, cafés, clubs, restaurants and hang-outs for the local Madrileños. He has helped me learn A LOT of Spanish from 4-hour chats over coffee. He has also become a great contact for all things I need help with in the city! I randomly said “yes” to going to an unknown-artist’s concert with a fellow Theta that lives in Spain. We may be 4 years apart in age, but I quickly realized how much we had in common. We had an absolute blast exploring Madrid together, and I have found it so comforting to find a friend in her! My “I randomly said ‘yes’ list” goes on and on. This experience cannot be described in a better word than exhilarating. I have noticed an incredible escalation of my own confidence. I have not “said no” to things like freaky-looking foods or roaming one of the largest cities in the world alone. I have been meeting people from every continent. I have had the opportunity to travel to new cities. My Spanish skills are improving daily, and awkward invitations (where I was tempted to say “No”) have turned into unforgettable adventures and GREAT friends. School is officially starting and my new classes are definitely overwhelming. It is intimidating being the only foreign/blonde/English-speaking person in the room. It is a struggle understanding Spanish professors who speak at a pace of 100 mph. I am not going to kid anyone- this whole “school” thing is downright terrifying. However, my university experience is still in the beginning stage. I am still in the process of figuring out my final schedule, as well as navigating my new campus. BUT I am super optimistic that this daunting and challenging process will help me grow in all the ways I need to. Even though I am sometimes unsure of myself, learning along the way has been my favorite part of studying abroad. So far I have conquered the subway system. I have learned how to pay rent for an apartment each month. I have learned how to maintain conversation for hours with strangers in Spanish. I have learned how to do “grown-up” things such as pay utilities/phone bills, grocery shop and cook each night. I have not hesitated to ask lots of questions. I have become confident in traveling the world. Everything seems to have fallen perfectly into place, and I am proud of how much I have progressed. I am SO glad I “randomly said yes” to throwing myself into this new culture, because this experience has been everything I have dreamed of and more. My bedroom! I have the perfect little balcony with an amazing view. However, the window is VERY old and thin. My room is very cold and noisy, but it is all part of the experience! Another view of my bedroom. My street view from my balcony. Calle de la Colegiata. This is a view from the entry hall. My bedroom door is located in the sitting area. There is a galley kitchen and another hallway with more rooms to the right. Here is a view of the living room. This is where my flat-mates and I eat meals and hang out! My bedroom is the door next to the table. Here is my bathroom. There are 2 bathrooms in this flat shared by 5 people. We have a lovely bidet too. Anyone want to come try it? Kitchen View. There is no dishwasher. The laundry machine is also located in the kitchen. We do not have a dryer. Clothes must be dried on the clothesline outside the window overlooking the courtyard or on racks in the apartment. I think I will dry my underwear inside. There are 2 fridges in our kitchen and a gas stove and oven. Ovens are rare in flats in Madrid! My flat-mate Jill (from Holland) and I’s first time using the metro. One thing I was most anxious about coming to Madrid was living arrangements. My university, Universidad Complutense de Madrid, has no on-campus dorms or apartments. All students that attend this university live in the city and commute to school. Knowing this was very stressful for me. First of all, I am used to Oklahoma State where there are residential halls that are occupied by only students. In Madrid, I knew it might be more difficult to make friends considering my flat-mates would not necessarily be students. Secondly, I am only 19 years old and have NEVER had to pay rent. Thirdly (and possibly the most stressful and pathetic factor), I now have to learn to cook for myself. I ended up booking my flat through SpotAHome.com. I was skeptical about coming to Madrid alone, staying in a hostel and frantically looking for a place to live when I got here. SpotAHome’s website serves as a platform for landlords from many cities in Europe to list their properties online. It was very user-friendly! Once I booked, I was re-directed to communicate with my landlord directly. Angélica (my landlord) was very responsive and made the renting process an easy experience. I must say that it was very comforting having a place to come to when I first arrived. Now that I am all settled in, I have realized that I have lucked out BIG TIME. My flat-mates consist of Louisa and Sandra (21) from Canada, Ollie (22) from Finland, Jill (19) from the Netherlands and Christopher (22) from Australia. Even though I am not living with Spaniards, I am having the greatest time learning about many other cultures. We all speak English with each other in the flat, and are all starting to become great friends. Our flat is on the second floor of the building. I have 3 keys, one to enter the building, one to the flat and one to my personal bedroom. The building has an ancient caged-elevator that fits no more than 2 people. We also have a doorman, who my landlord and flatmates refer to as “Tiny Bald Man.” He is a 4’10” middle-aged man that is always there to monitor the building and answer questions. He always tries to start-up conversation (in Spanish) as you mosey on through the building. The location of our place is very exciting. We are in the city center, steps away from Puerta del Sol and Plaza Mayor. There are countless attractions such as Mercado de San Miguel and El Palacio Real (Royal Palace), clubs such as Kapital, and restaurants such as El Botin (oldest restaurant in the world) within walking distance. I obtained a metro pass (only 20 Euros a month!) that allows me to use the underground and buses as much as I want. I have also made a few trips to the markets to buy groceries, but had to learn to not buy heavy things when I have to carry them a couple blocks home. This week I have been doing administrative activities such as groceries and a metro pass, but also taken the time to get comfortable with my new city. My days have consisted of meeting up with new friends, shopping, trying new restaurants, exploring the narrow streets and getting very very lost. I am having the time of my life! Each day I have been trying to take a step back and soak-in all the chaos around me. I’m constantly amazed by the quick progress I have made in one short week. Aside from the jet-lag, “moving” to Spain has been a smooth sail. My rockin’ flat-mates, good friends, sweet landlord and Tiny Bald Man have definitely made this a very easy transition, and helped this place feel a lot like home. As I approached the last hour of my flight, my stomach wrestled itself into unbearable knots. To be honest, I have never been so completely terrified in my entire life. We finally landed at 7:45 am and I made a break toward customs and made it through in seconds. It took a total of 28 minutes to make it from our arrival gate to the baggage claim area. The airport was massive. My adrenaline kick allowed me to 50 some-odd pound bag off the carousel. Once I got it, I decided to sit down and pull my confidence together before making my grand entrance. I sat for about 15 minutes, said a few prayers and made my way toward the taxis. I snagged a taxi and asked the man to take me to the specific address of my flat. We made the trip in complete silence, listening to Spanish pop and watching the sun rise over Spain. We arrived to the building and the man flew out of the car and launched my luggage into the middle of the street before I could close the door. He jumped back in the car and zoomed off, leaving me to chase after my belongings in the middle of the street and almost getting hit by 3 cars. I bolted out of the street and out of harm’s-way faster than one could snap. I tried opening the door to the lobby of the building, but it was locked. I stood outside for 15 minutes, with all my stuff, in complete panic mode. I was 10 minutes early to meeting my landlord, and she had not arrived. I finally caught a glimpse of a young girl walking toward the door. My new roommate Louisa let me in the room to set my stuff down. We rode in an ancient one-person caged elevator up to the floor. I traveled back downstairs to wait for the Landlord. She arrived and she was a petite, cute Spanish woman. She gave me the keys and showed me around. It was all in Spanish. She even gave me my first official “kiss on each cheek” greet. I met both my roommates. Louisa is 21 year-old girl from Toronto, Canada and Claudio is a 22 year-old male from Florence, Italy. We all communicate with each other in English. Louisa just arrived, and she is studying at a different university than I. Her dad (who is from Bulgaria) came to move her in and hang out with her for a week. I met them both when they were eating lunch in the flat. Louisa was on her way to class and offered to show me the way to the metro. I followed. I went to the metro station to get a transportation pass. Louisa went to class. When I was done, Louisa’s dad popped out of thin air. He asked if I knew my way back, and I shook my head wide-eyed. He offered to walk me around the area and I agreed. He showed me the nearest markets, metro stops and gave brief descriptions of the surrounding streets. Then he dropped me off at the door of my flat. From there I went on a walking excursion alone. I walked a total of 3.5 hours. My apartment is in the heart of Madrid. The coolest plazas, shops and restaurants are all at my doorstep. I wandered through some of my favorite Spanish clothing stores. I browsed through Mercado de San Miguel, one of the most famous markets in all of Spain. I also took a quick stop at the Royal palace and watched the sun set behind it. I made quite the trek without a map. However, at the very end I took a wrong turn. I got very very VERY lost for another hour. I asked 8 locals for directions. I couldn’t understand anyone. Finally I asked a sweet woman who still spoke Spanish, but spoke slowly and was very understandable. I eventually made my way home. I ended my day by walking to the market and buying an apple for dinner. I came back to the flat where my roommates were hanging out in the living room. They asked me to join them in a wine-night. So we all stayed in, sipped wine and talked for hours. The countdown is on! One week until I depart for Madrid. The past few months have been filled with countless hours of planning and a whirlwind of emotions. But the day is almost here! Here is a little overview of what my study abroad experience will look like. January – July I will be studying at Universidad Complutense de Madrid in Madrid, Spain. The university sits in the heart of the city and boasts a whopping 100,000 students. The university has no on-campus living dorms, so all students live in the city and take the subway or bus to school. Also, all my classes will be taken in the Spanish language. Earlier this year I had to take a European language exam to determine my language proficiency. I (somehow) passed the exam through an interview process, which was vital to be accepted into the University. What am I taking to Spain? As much as I can physically handle! I have one large suitcase and a carry-on. When I arrive in the Madrid airport there will be no services to help carry my stuff or take me to my living arrangements. My plan is to grab a taxi, and kindly ask (in Spanish, of course!) the driver to take me to my apartment building where I will wait to meet the landlord. I need to pack as much stuff possible for the change of seasons, but little enough so my tiny arm muscles can survive. I have recently been anticipating everything that could occur on my first day in Spain. I am aware that once I meet with the landlord and get settled in my apartment, I will be completely on my own. Some things that are on my to-do list include setting up a Spanish phone plan and purchasing a month-long metro pass to have transportation around the city. I also need to wander around and find some sort of market to buy a few groceries. I have two whole weeks to get settled in the city. After that, I will be attending an “Exchange Student Orientation” where I will be able to enroll in my classes and learn important things about the University. I have also signed up to take a two-week Intensive Language Course through the school. I will be taking a proficiency test upon arrival and they will place me in the class level that best suits. This class will surround me with other students in my same position, but from all around the world. My real classes will begin mid-February. As you can see, this is mostly an independent trip. I don’t know of any other American that will be at this University. I am also not going through any study-abroad company that makes all the accommodations for me. I have made all plans on my own, such as obtaining a student visa, finding an apartment, booking a flight, signing up for travel insurance and so on. This process has already been the largest learning experience, and I haven’t even boarded the plane yet! As overwhelming as it has been, I am proud that everything has finally fallen into place. It makes me so excited to see what the next 6 months have in store. Who says you can’t skip class and go to Chicago?! Well, most would advise not to miss school. Especially the week before finals. In my case, however, it was entirely necessary in order to obtain my student visa to move to Madrid in a couple weeks. I have been receiving many questions about the Visa application process lately. If you are planning on studying abroad, my best advice is to check the requirements for the specific country you are planning on visiting. Some countries don’t require a visa at all! Some might require one, and it is as simple as applying for a passport. There are also trickier countries like Spain, that require you to attend an in-person appointment at the Consulate. For Spain, the consulates most convenient for Midwestern residents are in Chicago and Houston. Since I will be a studying and renting an apartment in Spain, a 6 month Visa was necessary. During dead-week, my dad and I hopped on a plane for a quick one-day trip to the Windy City. The Consulate was located right across from the Bean on Michigan Avenue. In all honesty, I expected the Consulate to be some grand, Spanish-bleeding building with tight security, heavy traffic and gaudy Spanish decor. To my disappointment, it was a mere white room on the 13th floor of a random office building. It housed 15 folding chairs and 3 little service windows. There was a TINY framed picture of the current King and Queen on the wall. That was about it. I mean come on, a flag or crest or something would have been a nice touch. The appointment took a whopping 15 minutes, if even that. My dad and I managed to grab coffee, visit the Bean, shop, eat lunch, go up in the Willis Tower and bop around the city the rest of the day. We headed back to Kansas City that evening. I definitely underestimated the amount of things I could do in Chicago in one day. My sorority Kappa Alpha Theta takes a lot of pride in our philanthropy CASA. CASA stands for Court Appointed Special Advocates. This organization provides court-appointed advocates to abused and neglected children in the court to make sure they don’t get overburdened by the legal and social service system. Every year, my Theta chapter hosts an event to raise money for our local Payne County CASA in Stillwater, OK. In the past, we put on the event “Cupcakes for CASA” where a $5 ticket would enter you into a house of unlimited cupcakes-every flavor imaginable. This year we got it approved to change the theme. November 19, 2015 marked the first annual “CASA Carnival” along with a fraternity bubble-soccer tournament held the following day. The marketing committee made this change with the hope to raise more money for the cause. Carnival tickets were still $5 from a Theta or $7 at the door. The bubble soccer tournament also required a registration fee from each fraternity. The Carnival was held on a Thursday night from 10 pm to 1 am. The ticket entered one into a wonderland of carnival food, such as nachos, cotton candy, popcorn, caramel apples, donuts and apple cider. The entire dining room of our house was canopied by a black and white carnival tent and decorated with antique coke bottle trays, glass jars filled with candy, strung popcorn and a photo booth with props. The event surpassed our expectations. The decor was immaculate with the gold, pink and baby blue accents. Students from all over campus enjoyed the festivities up until the final minute. In the end, we are most proud that we raised an incredible amount for this great philanthropy. We raised $6,000! Go Theta! Go CASA! Go Pokes!!! Life is too short not to have a spontaneous adventure, right?! As a born-and-raised Kansas City girl, it was extremely difficult not being in my hometown during “blue oKCtober” when the Royals dominated the World Series. I grew up bleeding blue. I grew up attending several games each year, even when the Royals were painful to watch and couldn’t score a run. For a short while, I even had a small crush on KC’s mascot Slugger the lion. Being at Oklahoma State without a car, going home for a weekend trip is nearly impossible. This semester, my only planned trip to go home was for Thanksgiving. A couple days after the Royals won the World Series Title, Kansas City had planned a homecoming-type parade for the players and city to celebrate the big win. My mom sent me a text the day before the celebration. She was excited that all Kansas City metro schools had been cancelled in order for all KS residents to attend the parade. Without hesitation, I ran around my sorority and tried to recruit a couple friends to make a spontaneous trip to Kansas City for a night. I luckily had 2 friends agree. We left an hour and a half later. All in all, the trip ended up being 28 hours. 9 of those hours included driving. 20 hours in Kansas City was just enough to bop around downtown, celebrate with nearly 900,000 other loyal Royals and consume some of the world’s best barbecue. In college I have figured out that not having a plan is the best plan. Skipping class for a single day to celebrate history is worth it. Making memories with my friends was so much more worthwhile than a boring lecture in Econ.